A long, long time ago in a galaxy far, far away I wrote a novel. Well, I wrote the novel right hear on planet Earth, not far way, but it was finished over fifteen months ago, which is a long time ago. As a novel writing novice, I thought the step from first draft to publication was a small one. Following the advice provided by Stephen King’s On Writing, I sat down to read my whole book in one sitting after giving myself a nice break. I had my pen ready, and prepared to make a few brief notes as I fell into my book. I’m a great reader. I love novels. Short novels, long novels, well written, good plot, and why-the-hell-don’t-I-stop-reading-this-drivel novels: Twilight series, I’m looking at you. I love them all. No iota of my mind was worried about this step, the reading of my book. Oh, silly me. Reading MY book was nothing like reading A book. I would sit down to read and become stuck in the land of commas, verb tense, and sentence structure. Hours would pass and I would have “read” a few measly pages. This scenario happened over and over. I couldn’t read my own book. Finally in July inspiration hit. You can email files to your Kindle and read them on your device. 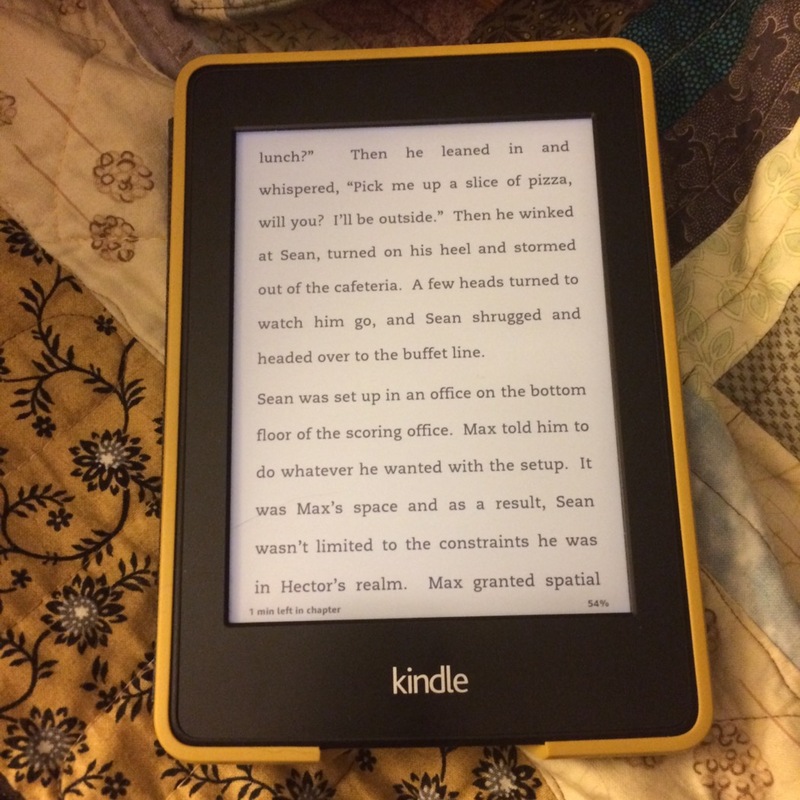 I have known this since I got my first Kindle and used to send technical reports to it when I wanted to do a last cut for readability. (If you want to try this for yourself, check out the Send to Kindle page.) The solution worked. Unwilling to mark up my Kindle screen with annotations I was able to read my book. I also did this while I was on vacation so my access to paper and writing implements was limited. Gloriously, many of the pacing issues I thought I had disappeared when I wasn’t distracted by note taking. At times my book was good, and once or twice it was really good. I did come up with a few big picture things I wanted to fix, which I think is the point of the first big read. Hooray! Problem solved. Now all I had to do was edit, which in On Writing takes two measly pages. You look for big plot holes, awkward character motivation, and ask big questions while you edit. After two drafts you bestow your book on your ideal reader. Easy peasy. Folks, let me tell you that I have been struggling with how to execute those two pages for five months now. I have begun to understand that King’s book was called On Writing and not On Editing for a reason. I needed help, because I’d moved past Reader’s Block into Editor’s Block. Have you ever found yourself in either place? If so, I’d love to hear your solutions. Keep reading and I’ll share how I am clearing out the blockages. My first of a series on reader’s and editor’s block. Well, I am exactly where you mention you are with the WIP I want to finish ASAP. I started planning for the book in September, 2015. It is a non-fiction, a book on Fear. I did not rush myself into finishing it because it was going to be penned from personal experience. 2. I will request fellow bloggers to do guest posts on my blog, and the theme would be Fear. The posts will set the tone of the book release. I am hoping that the public declaration will force me get out of the rut and finish it. Keep updating as to how you are dealing with your reader’s/editor’s block. Need the inspiration. This is amazing to me. You are a much faster editor than I am, but I’m a total novice to this process. I can edit my technical writing, but just had no idea where to even start editing a full length novel. Best of luck to you if you set your deadline, and I’ll be watching your blog to see how things go! Thanks so much for the comment, and I’ll do my best to keep documenting my own process. We’ll learn together. I don’t know if you want to wait that long, but NaNoWriMo has a yearly editing event, called “Now What?”. It’s usually during January and February; but if you can’t wait over a month- here’s a link to archived “Now What?” resources from previous years. What?!?! This is amazing to know and dovetails nicely with my current editing plan. Thank you SO much for letting me know about this. I’ve never participated in NaNoWriMo, so had no idea they provided editing resources. Yay for blogging friends!